"I am flying a kite"
This week we did some fun St. Patrick's Day projects. We made a mosaic shamrock, a pattern fruit loop necklace, and pots of gold (practicing number recognition and addition). We also worked on rhyming and journal writing. 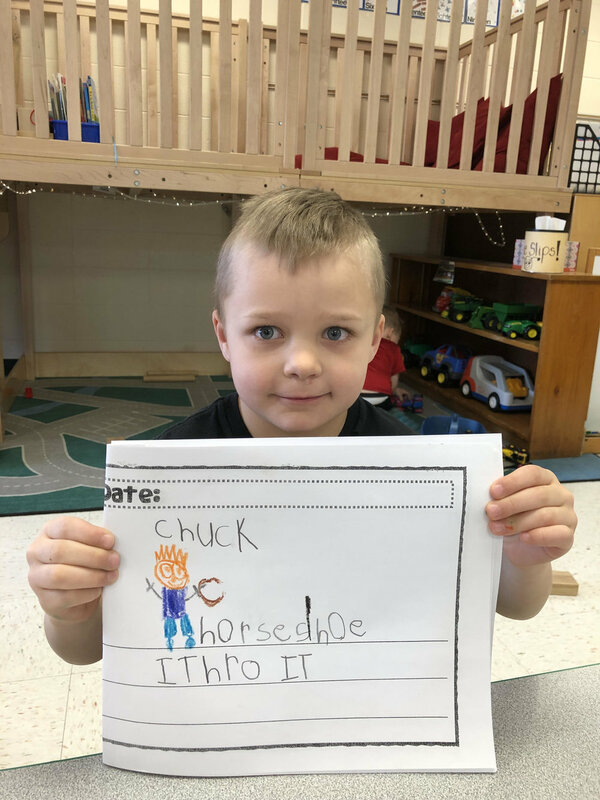 I'm so impressed with how well students are starting to be able to write down the sounds they hear to make words, and draw pictures to match their writing. We learned the letter Mm and worked on stating the problem in Second Step. Rather than yelling, "stop it!" or "I can't do it" students have been reminded that the first step to solving a problem is stating the problem. Next week we will be doing some Easter activities, including dying eggs and having an egg hunt in the classroom. We will be learning the letter Nn, and in Second Step we will be work on thinking of solutions to our problems. Reminder: There will be no school March 26th-30th due to Spring Break. "I like my brother, Ben"